A real-life thriller—the story of kickbacks and payoffs, of shady deals struck in secret with known felons; a story in which half a million people lose enormous sums—some their life’s savings—in the largest securities fraud of the 1980s, with names like Onassis and Bush numbered among the victims. KURT EICHENWALD has written for the New York Times for more than seventeen years. A two-time winner of the George Polk Award for Excellence in Journalism and a finalist for the 2000 Pulitzer Prize, he has been selected repeatedly for the TJFR Business News Reporter as one of the nation’s most influential financial journalists. His last book, the highly praised Conspiracy of Fools, was a New York Times bestseller. His book The Informant is currently in development as a major motion picture. Eichenwald lives in Dallas with his wife and three children. ABSORBING . . . A PAGE-TURNER . . . THE BOOK IS GREAT FUN TO READ . 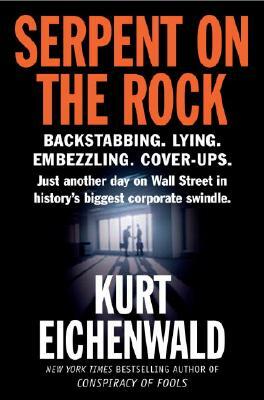 . . As a tale of ego and greed on Wall Street, Serpent on the Rock is up there with Barbarians at the Gate. A COMPELLING TALE, richly laced with details, that shows how trust can be quickly tapped for huge profits by unscrupulous advisers. ENGROSSING . . . A BLOW-BY-BLOW ACCOUNT OF AN UNPARALLELED CRIME. characters . . . comprehensive, impeccably sourced and striking in its detail. Kurt Eichenwald’s cinematic storytelling and command of complex details create a disturbing and damning drama. IF YOU WANT AN INSIDE LOOK AT WALL STREET AT ITS WORST, READ THIS BOOK. BLOWS AWAY THRILLERS BY JOHN GRISHAM AND TOM CLANCY . . . This book has it all: suspense and horror, greed and pure malice, along with heartbreak and the eternal, valiant struggle of the little guy against the forces of evil . . . By two sentences into Serpent, I found myself hooked, unable to put the book down.